Harry Potter fans rejoice! 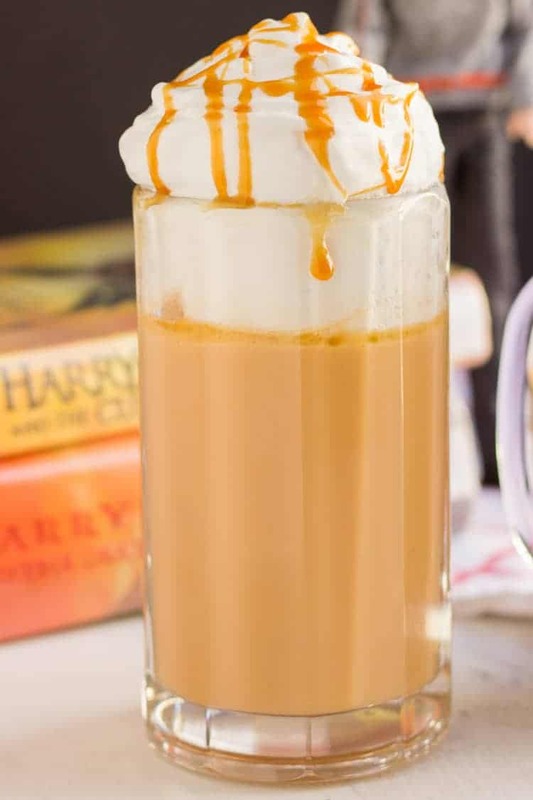 We have made the very best Hot Butterbeer recipe outside of the Wizarding World of Harry Potter! Brown sugar, butter, butterscotch, and some other secret ingredients to give it some special magical spice is all you need to recreate this delicious treat. 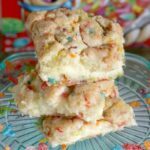 This post is sponsored by Walmart, but all recipes and opinions are 100% my own! 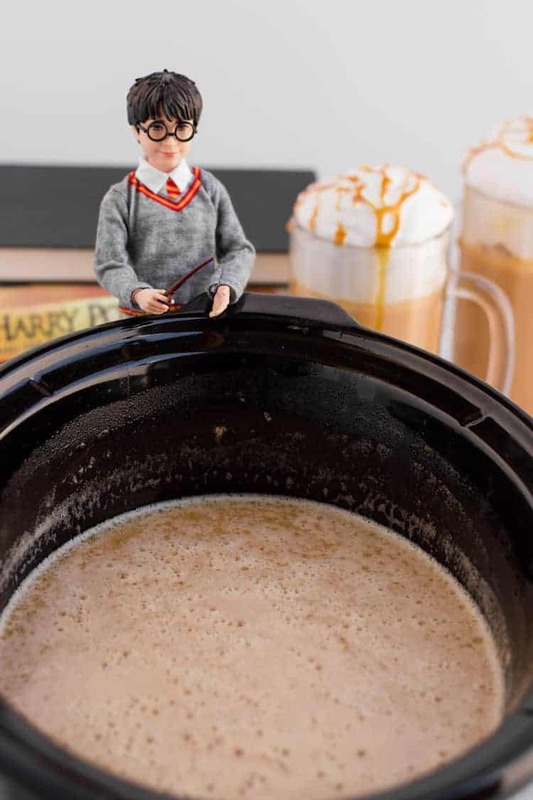 Why go all the way to Florida or California to Universal Studios Wizarding World of Harry Potter, when you can make your very own cup of Butterbeer right in your own home? 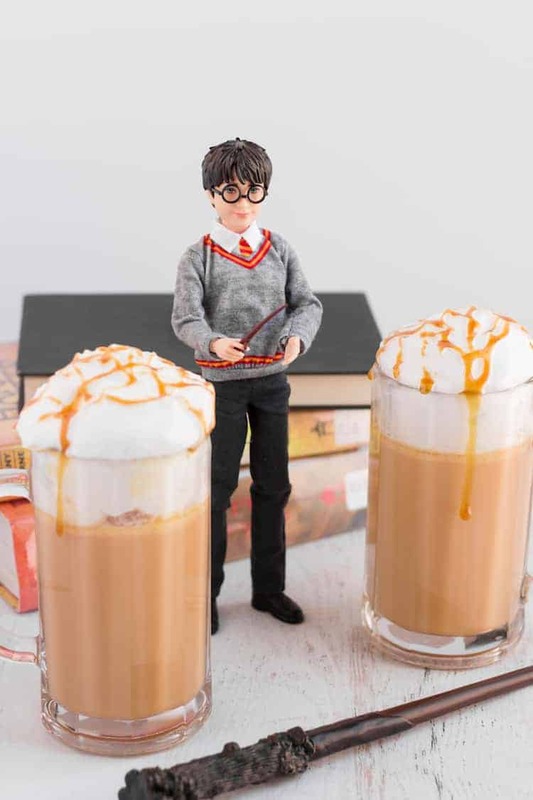 We have been wanting to make our own Hot Butterbeer recipe for ages, ever since our Frozen version went viral a few years back. 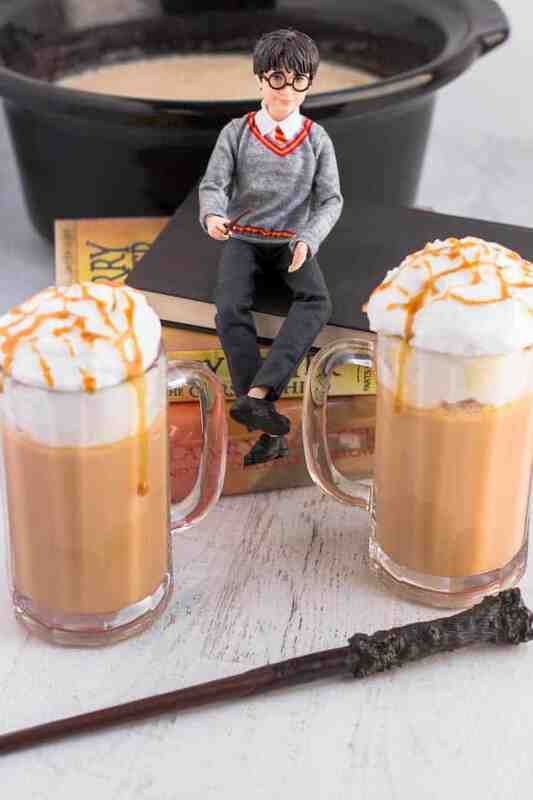 So when Walmart came out with their new line of Harry Potter toys, many available only at Walmart, I thought we would celebrate with a new Harry Potter recipe! Before we get into the recipe, let’s talk about these new toys that Walmart just launched! My kids are literally going to go crazy over them! 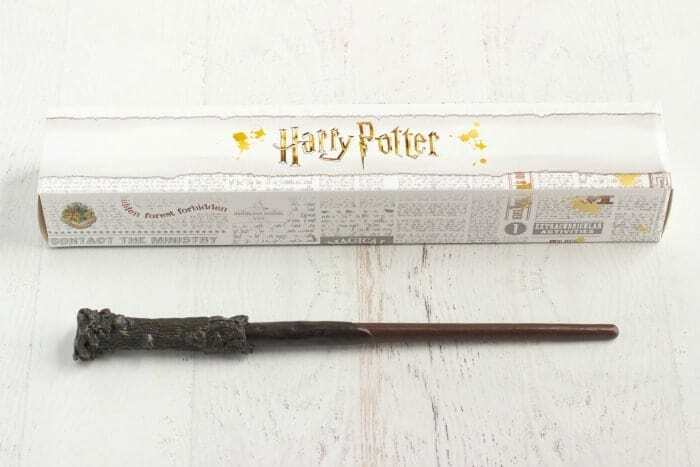 Not only do they have the most adorable line of Harry Potter dolls, but they also have two items that I am particularly excited about – the Harry Potter Mystery Wands only available at Walmart and their Interactive Training Wands! So, the Mystery Wands are awesome! There are 9 different wands that you may get, but you won’t know until you open up the box! I opened mine and got Harry Potter and was super excited. What is great about these wands is that you don’t have to go to Diagon Alley to get yours, you can get them right at Walmart! They are also very reasonably priced – so you will not break the bank! The Training wands are super cool! There are 11 spells that you can learn and the wand recognizes the motion to know if the spell was performed correctly – you can even play against a friend! 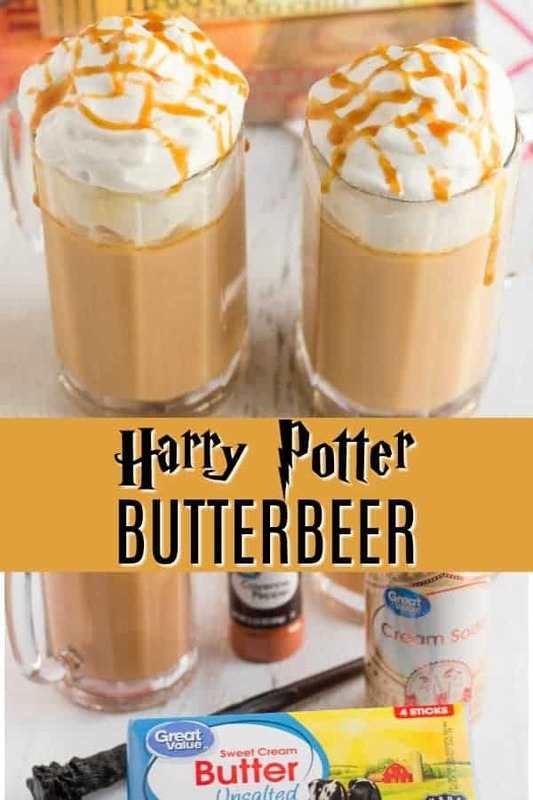 When it comes to Butterbeer recipes, we know our stuff! We are obsessed with our Hot Butterbeer recipe, but you cannot miss our Frozen Butterbeer recipe and our Butterbeer Ice Cream! Now…let’s talk Butterbeer! Some Butterbeer Recipes are super labor intensive, not ours. Not only is this a very easy recipe, but it also tastes very close to the “real thing”. It is definitely Harry Potter Party worthy and pretty darn close to the Butterbeer from Universal Orlando! Butterbeer is a well-known beverage mentioned throughout the Harry Potter book series. It is a delicious drink that was served to the students of Hogwarts, in the town of Hogsmeade, at the pub, The Three Broomsticks. When the Wizarding World of Harry Potter opened at Universal Orlando, it became an immediate sensation! Our butterbeer recipe is a non-alcoholic version. There are recipes that include alcohol, but there is no alcohol in our recipe – so kids and adults can enjoy! Our hot version of Butterbeer is very easy to make. You are basically just mixing and heating up our 8 ingredients, which can ALL be purchased at Walmart. Walmart has their own Great Value line of products, which we used for most of our ingredients! We liked to use the ginger and cayenne to give it a little after kick (VERY LITTLE – don’t worry if you don’t like cayenne, it is almost non-existent when mixed in. Feel free to use a little more 1/2 tsp of each, if you want to notice those ingredients more! 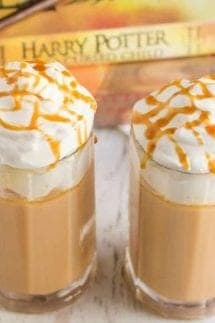 As I mention in the notes of the recipe, we like to top our drink off with some whipped topping and either butterscotch or caramel sauce. Pair your butterbeer with a Chocolate Frog or some Bertie Bott’s Every Flavor Beans! Brown sugar, butter, butterscotch and some other secret ingredients to give it some special magical spice is all you need to recreate this delicious treat. Combine milk, butter, and brown sugar in a large microwavable bowl. Heat in microwave for 3 minutes. Whisk together until the butter is melted and sugar is dissolved. Whisk in 1/2 bottle of the cream soda. Add in the butterscotch instant pudding mix. Add the vanilla, ginger, and cayenne. Pour in the rest of the bottle of the cream soda. Either heat in the microwave, on stovetop or pour into a crockpot to keep it at a consistent temperature. 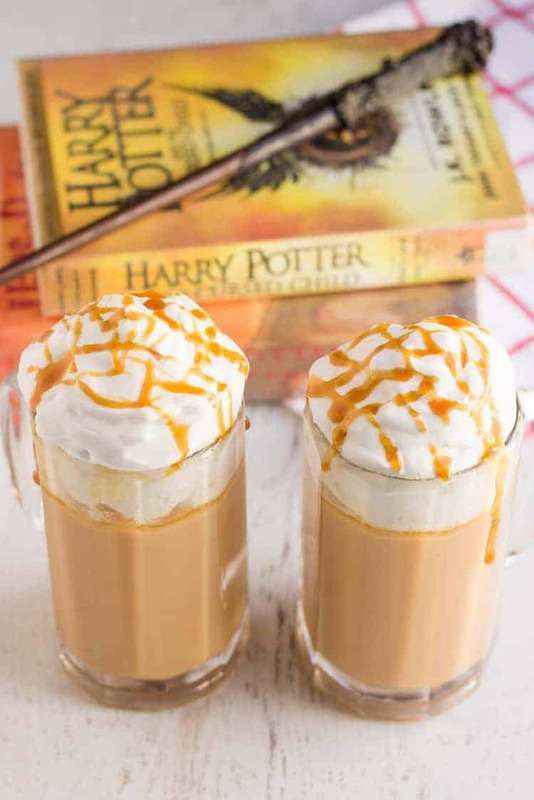 (Optional) Add whipped cream to the top of each cup of butterbeer and drizzle butterscotch sauce on top of the whipped cream. *If it is too thick add 1 cup of whole milk. Stir to incorporate. 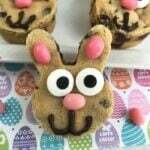 I’m trying to make this for a gathering of 12 (mostly children). I see that the recipe makes 4 servings. How many ounces is a serving? If I quadruple the recipe, it comes put to me needing 8 liters of cream soda which seems it would produce an excessive amount of beverage.